Who claimed to find Noah’s Ark this week is almost as interesting as what they found. The team is described as being led by ‘Chinese and Turkish evangelical Christians’. Neither country is renowned for freedoms given to evangelical Christians and yet here they are – exploring Mt Ararat, conducting press conferences and influencing Christian and world agendas. It is a reminder of how the burden of Christian faith has moved from the west to the east. While the western church languishes in its past glory, the churches of Asia and even the Middle East are rapidly growing, fiercely faithful and increasingly see their mission to the world. But that’s a blog for another day. What of Noah’s Ark? It is early days for this latest claim and Christians are among those that are wary of it. In case you missed it, a Chinese-Turkish team from Noah’s Ark Ministries International held a press conference on April 25 in Hong Kong to present their findings and say they were “99 percent sure” that pieces of wood found at above 4,000 metres elevation and dated as 4,800 years old were from the biblical Noah’s ark. 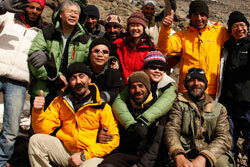 The team has been searching since 2003 and was first led to this site in August 2006 by Ahmet Ertugrul (known as Parasut), a Turkish professional mountain climber, who claimed to have found a suspicious wooden structure in a cave at an altitude of 4,000m on Mt. Ararat. He contacted the Hong Kong expedition team and provided a specimen of the wood. It was examined by the Applied Geoscience Centre of the Department of Earth Science at the University of Hong Kong verified the specimen to be petrified wood. An expedition in February 2007 was unable to enter the cave due to its collapse but in August that year, the team claims to have uncovered the petrified wood structure, taken new samples, and measured it. A major press conference was held with wide press coverage. A variety of Turkish scientists were now involved. Further attempts to explore the site occurred in 2009 and the one being reported now occurred in October 2009. It includes photos and videos and the claim that the wood has been carbon dated and is aged at 4,800 years old. The finding of any wooden structure at such a height is significant because trees do not grow that high and human habitation has not been reported on the mountain above 3000 metres. Locals living around Mt Ararat have a saying, passed down through the generations, ‘There is an ancient boat on the mountain’. While many ark researchers and scientists ar lauding the discovery, at least two original members of the team itself are casting doubts. Dr Randall Price believes a hoax may be involved. ‘If the world wants to think this is a wonderful discovery, that’s fine. My problem is that, in the end, proper analysis may show this to be a hoax and negatively reflect on how gullible Christians can be,’ he said. While he refuses to elaborate, some media are reporting that a leaked email from Price shows that he believes a group of local Kurdish men may have trucked wood up the mountain and staged a hoax for the Chinese team. In the email Price says he was there at the time and knew about the hoax. Price is a longtime searcher himself for the ark. As a member of Noah’s Ark Search LLC, he had gone on a number of expeditions to Mount Ararat. However, another former team member, with his own doubts, counters Dr Price’s hoax claims. Dr John Morris, president for Dallas’ Institute for Creation Research, has been a consultant to the team since 2005 but declined an invitation to be a part of last week’s press conference in Hong Kong. Either way, he believes only serious scientific work on-site can resolve this and other issues. In the meantime, local Turkish officials will ask the central government in Ankara to apply for UNESCO World Heritage status so the site can be protected while a major archaeological dig is conducted. Read the Biblical account of Noah’s Ark. ‘According to the Judaeo-Christian Bible, Noah was a ‘righteous man, blameless in his generation’ (Genesis 6:9) at a time when ‘the Earth was corrupt in God’s sight, and the Earth . . . was filled with violence’ (Gen 6:11). God therefore decided to destroy the whole world, yet preserved the life of Noah and his family because of Noah’s righteousness. ‘God instructed Noah to build an Ark of gopher wood 300 cubits long, 50 cubits wide and 30 cubits high, for God was to destroy the world with a Great Flood. God also told Noah to take with him two of every sort of animal on to the Ark (Gen 6:19-20). ‘Having spent one whole year on the Ark, the floodwaters receded, and the Ark came to rest on the mountains of Ararat (Gen 8:2-4). God told Noah and his family and all the animals to leave the Ark and to fill the world once again. Berossus, a native historian of Babylonia in 275 B.C. Nicolas of Damascus, a Greek historian and philosopher in 30 B.C. Eutychius, an Egyptian Arab, Patriarch of Alexandria, a famous historian and physician in the 9th Century A.D.
Posted in FindingFaith, MediaMoments, News, Travel, World.Tagged China, Christian, discovery, Noah's Ark, science, Turkey. more thought provoking reading – bring on the blog on the burden of Christianity (lucky the burden is light 😉 in the East. Sometimes western Christians can feel like Noah(?). Kurdish-Chinese team found something really or it was just a fake, we still dont know. But many people in Kurdistan belive in that story and kurdish artists paint this like mystic things. I better read this one first! Agreed Ed… One of a number of touch-points for Muslims and Christians. Authenticating Noah is important to Muslims too – he’s one of their prophets.